NORTH BAY, Ont. – The North Bay Battalion erupted for goals by Kyle Potts, Mike Amadio and Brett McKenzie in a span of 1:56 early in the third period to rally for a 3-2 victory Thursday night over the Erie Otters, who boast the best record in the Ontario Hockey League. 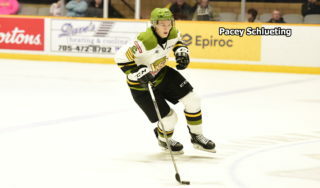 The Battalion, which dressed 19 players, one below the limit, and was missing five regulars, improved its won-lost-extended record to 20-14-3 for 43 points, tied with the Niagara IceDogs for third place in the Central Division of the Eastern Conference. Goaltender Jake Smith made 31 saves before a raucous crowd of 3,364 that saw the Troops, who trailed 2-0 through 40 minutes, earn a ninth straight home-ice win, their last loss at Memorial Gardens a 4-3 setback Nov. 19 to the Kingston Frontenacs. Alex DeBrincat and Jake Marchment scored for Erie, which lost for the first time in six games. Starting goaltender Devin Williams allowed one goal on 13 shots before leaving with an injury. Jake Lawr surrendered two goals on five shots. The Otters, who have won 12 of their last 14 games, are 32-5-1 for 65 points atop the Midwest Division and Western Conference. Erie is 15-2-0 on the road. Said Butler: “Any time you play one of the top teams, you can give them a little too much respect, and a lot of our guys did that. Once the game got going, in the last part of the first period and then the second, we played a pretty good game. The turnaround started when Williams went behind his net to play a puck chipped down the right wing, falling backwards and appearing to injure his left shoulder as the puck went off his catching glove on the ice. Max Kislinger scooped up the loose disc and fed it in front to Potts, who backhanded it into the vacant cage at 1:54. Kyle Wood had the second assist on Potts’s fourth goal of the season. Williams received attention from Erie athletic trainer Andrew Kupniewski before leaving the ice and heading to the dressing room, later returning to the bench. The Troops greeted Lawr rudely, scoring on their first shot as Amadio converted a Mathew Santos feed from the top of the right circle at 3:17 off a rush. The goal, which sneaked under Lawr and got inside the right post, was Amadio’s team-leading 23rd. McKenzie collected the winner 33 seconds later, charging to the net for an initial shot and putting the puck home after it glanced out front off the right skate of David Sherman at the right side of the crease. Steve Harland also assisted on McKenzie’s 17th goal. Smith shut the door the rest of the way, turning away chances for DeBrincat, Marchment, Dylan Strome, Vanya Lodnia, Travis Dermott and Taylor Raddysh as the Otters outshot the Battalion 14-8 in the period. Lawr made a good save on McKenzie and denied Kislinger on a breakaway. DeBrincat opened the scoring on the power play at 9:36 of the first period, finishing off a backdoor play at the right post for his league-leading 34th goal. Erie got somewhat lucky in the second period after North Bay’s Mark Shoemaker hustled back to break up a two-on-one rush. He swept the puck back up ice, but it went directly to Marchment, who got the rubber to his forehand and wristed it between Smith’s pads from the top of the left circle at 12:20. Williams faced chances by Santos, Brady Lyle, Cam Dineen and Jacob Ball. The goaltender used his stick to thwart a rush off the right wing by Daniil Vertiy in the 11th minute. BATTALION BULLETS: The Battalion was 0-for-2 on the power play. 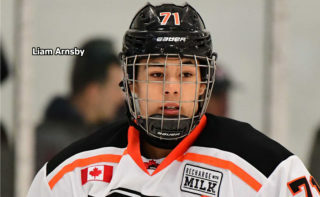 Erie went 1-for-1 … Opening lines featured Amadio centring left winger Vertiy and right winger Santos, McKenzie pivoting left winger Sherman and right winger Harland and Potts centring left winger Kislinger and right winger Justin Brazeau. Ball centred left winger Michael Silveri and right winger Aaron Dart … The Battalion was without Zach Shankar, who has an ankle injury, and Riley Bruce, Mike Baird, Brett Hargrave and Zach Poirier, all suspended. 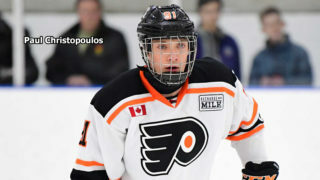 Hargrave and Poirier completed two-game bans … Silveri, an 18-year-old North Bay native, was called up from the affiliated Powassan Voodoos of the Northern Ontario Junior Hockey League for his Battalion debut. 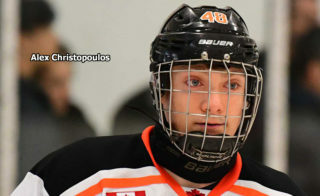 In his second season with Powassan, he has 17 goals and 18 assists for 35 points in 23 games. 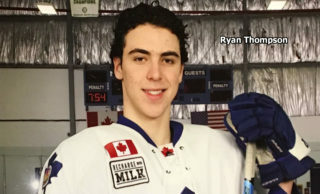 A sixth-round pick by Sudbury in the 2013 OHL Priority Selection from the North Bay Trappers minor midgets, he played eight OHL games last season without recording a point or facing the Troops. 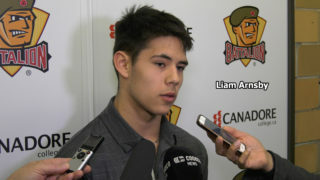 Silveri played six games this season with the Quebec Major Junior Hockey League’s Gatineau Olympiques, earning one assist … Dart, called up from Powassan, made his OHL debut Sunday, scoring the Battalion’s first goal in a 5-3 win over the visiting Barrie Colts that avenged a 12-2 road loss Saturday night.